On its surface, director Yeon Sang-ho's TRAIN TO BUSAN sounds like the worst kind of high concept trash. It's zombies on a train! Thankfully, beneath that surface one finds both a heart and a brain. And they aren't there just to be eaten, either. 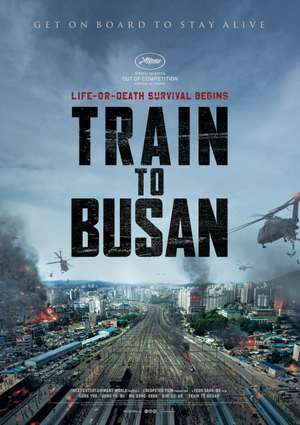 With its fast moving, not always undead infected, TRAIN TO BUSAN is clearly using Danny Boyle's 28 DAYS LATER as its template. But just as Boyle's take was still very much inspired by the classic zombie films of George Romero (the original versions of NIGHT OF THE LIVING DEAD, DAWN OF THE DEAD, and DAY OF THE DEAD) to use its premise as an opportunity for social commentary, so, too, does TRAIN TO BUSAN. And since the society being commented on in this case is South Korea's, what it has to say comes from a slightly different point of view than we're used to, while still being very much relatable. Beyond the one sentence description mentioned in the first paragraph of this review, the plot of TRAIN TO BUSAN centers on divorced dad Seok-Woo (Gong Yoo), a hedge fund manager who has custody of his daughter Su-an (Kim Su-an), but barely pays attention to her. All Su-an wants for her birthday is to go and visit her mother, and after completely screwing up with the gift he buys her instead, dad gives in and agrees to take her there by train. Unfortunately, a mysterious plague that turns ordinary people into crazed murderers has broken out. Our protagonists only learn this after they have boarded the train. And of course, you just know at least a few of the passengers are going to be infected. Amidst the action and scares, Yeon uses his film to comment on the self-centeredness and mistrust of his fellow South Koreans. As in Romero's zombie films, it's not the living dead that are the biggest threat to humanity's survival; it's our own human nature. Though not without horrific moments, overall TRAIN TO BUSAN is more action/suspense than horror. As Seok-Woo, Su-an, and a few other survivors try to make their way from one end of the speeding train to the other, presumably safer end, the way the film is shot recalls scenes from OLD BOY and THE RAID: REDEMPTION more than any gut munching zombie epic. The film is also surprisingly emotional, not just in how it resolves its main storyline, but in the B stories of several supporting characters as well. Maybe bring some tissues along with your barf bag. In all honesty, though, there isn't much of the requisite gut munching of the zombie genre to be found, so you may not need that barf bag after all. Oh sure, people get attacked and bitten by the infected and turn into crazed killers themselves, but the cannibalism aspect isn't played up like zombie fans are used to. I'm not saying sensitive viewers won't find a few moments disturbing, but if you're a die-hard horror fan expecting a gore fest, you won't find it here. And that's okay. There are plenty of gross-out zombie romps to enjoy or avoid, depending on your tastes. This is something a little different, and given the steady stream of derivative zombie movies that have been pouring forth since 28 DAYS LATER and RESIDENT EVIL opened the floodgates of the undead revival in 2002, something different is very much welcome. Keeping this from earning a better rating is the fact that it does drag and become a bit repetitive in the middle. A stronger music score would also have helped pump things up a bit. These are by no means fatal flaws, but worth noting nonetheless. 3 out of 4 stars.